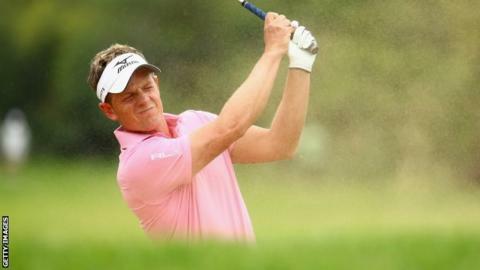 England's Luke Donald takes a one-shot lead into the last round of the Nedbank Challenge in South Africa after a three-under 69 lifted him to 13 under. Donald sank his fifth birdie of the third round on the 18th to move clear of compatriot Danny Willett, who had eight birdies in a seven-under 65. A third Englishman, Ross Fisher is in third on 10 under after a two-under 70. "That's kind of what the game plan was," said Donald. "To shoot a solid round, try and keep my nose ahead." Donald was also happy to avoid further confrontations with the local wildlife, after evading a charging baboon in the second round at Sun City. He added: "No baboons today fortunately. I didn't have to hop, skip and jump out the way like I did on Friday." Defending champion Thomas Bjorn had a four-under 68 but is tied 24th in the 30-man field with Lee Westwood on four over. Westwood, a two-time winner of the tournament, had five bogeys and a triple bogey on his card as he posted a 78, the worst round of the day. In contrast, Willett, whose only European Tour win came in 2012, had four birdies on his front nine and four on the back nine, with his only bogey coming on the 13th.